This dish is a take on the chinese restaurant favourite, lemon chicken. It isn’t really a dish you would eat as a single main course, but as part of larger chinese feast. Makes enough for four to six as part of a larger chinese feast. Start by cutting the tofu into 1/2 inch slabs and press the water out by wrapping the tofu in paper towel and placing a weight on top – I use a bread board with a mortar and pestle on top. Combine the sauce ingredients together in a small saucepan and simmer over a low heat for two minutes until the sauce is thickened. Set the sauce aside. 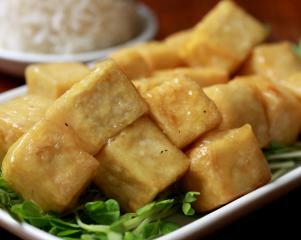 Cut the tofu into 1 inch cubes and toss in the corn flour. Heat an inch of oil in a frypan, then fry the tofu until it is lightly golden. Drain the tofu, toss it in the sauce and serve.